Info: After a long silence Cynfeirdd is back with the second album by Omne Datum Optimum Les Moissons Ecarlates. This is surely THE release of the year, 7 years day by day after the release of MISSA XXI. Since water has passed under the bridges and GAUTINIS Th+21, has also changed his mass wine a bit. If its universe was marked by his compositions tainted with religious and middle age esoteric, Les Moissons Ecarlates are more “classical music” oriented, in the good sense of the word and this as much in the instrumentation as in the vocal manner. The calligraphed and illuminated aesthetic of the beginnings has left place to a clinical white stained by flesh and blood illustrating perfectly the theme of the animal rights requiem. Whereas this contrast between image and music could seem surprising, even disturbing, when listening everything gets in place, and one knows these harvests are not unarmful. NOTE : the order of the songs on the CD is the good one, but songs titles 11 & 12 written on the booklet are inverted. 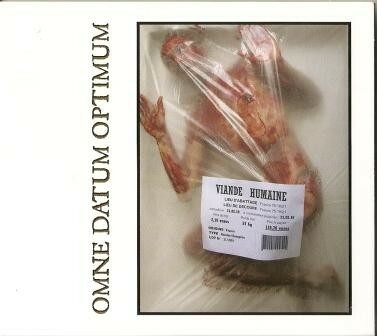 Customer evaluation for "OMNE DATUM OPTIMUM - Les Moissons Ecarlates CD (Lim489)"